Christopher Thurber believes camp is too special to allow homesickness to mar a child’s experience. As a clinical psychologist at a New Hampshire boarding school, a consultant and professional staff trainer to camps in the United States and Canada, and waterfront director at his childhood camp, he has become an expert on the pangs some children feel while at summer camp and the anxiety experienced by some parents at home. 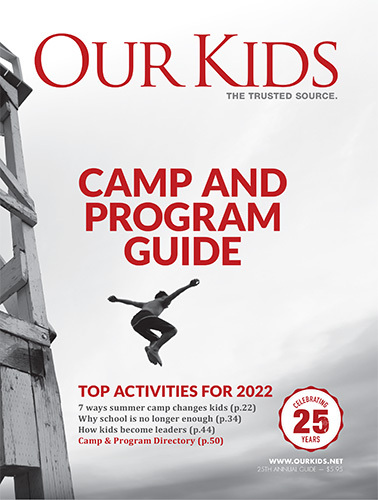 Thurber co-authored a 2007 academic report on homesickness while at places like summer camp, which was published in The Journal of Pediatrics. Based on his findings, Thurber developed a DVD-CD set on homesickness prevention, a project sponsored by the American Camp Association. "Homesickness is a widespread experience. We found 95 per cent of boys and girls ages eight to 16 reported some feelings of homesickness," he says. Rather than patting kids on the back and telling them that homesickness will go away, he believes it is healthier and more effective to look at prevention. Thurber’s study finds that preventative steps, such as coaching parents and teaching kids coping skills ahead of time, lowers the intensity of homesickness felt by first-time campers by 50 per cent. Involve children in choosing their camp. If they are part of the process, they are less likely to feel anxious about going. Arrange practice time away from home—a two- or three-day sleepover with a relative or close friend—long before camp starts. Try to introduce the child to other campers or counsellors who will attend the same camp. Reassure children that feeling homesick is normal. Plan coping strategies, such as writing letters home. Write practice letters and pack paper and pre-stamped, addressed envelopes for camp. Don’t express anxiety with comments such as "I hope you will be okay" or "What will I do without you?" Such sentiments will cause kids to worry while they are away. Don’t make a "pick-up plan" or agree to bring your child home if he feels homesick. It undermines a child's sense of confidence in their ability to cope and enjoy the camp experience. Share your anxiety and feelings about missing your child with another adult—never your child. Have trial separations where your child has a weekend sleepover with a relative and you don’t telephone. Remind yourself that camp is an incredible experience that will support your child as he or she blossoms into an independent self-reliant adult. Read more about Dr. Christopher Thurber.